Zaful Sweater, Zaful Jeans, Marc B Bag, Rosegal Boots. We are now one month into the year and it's the perfect time to say hello to February, which will be short, rainy, overcast and easygoing. Same situation is expected for us in fashion which is gonna stay cozy and comfy till the spring vibes will fill the nature. Winter in the island gives me time and chances to explore Corfu, to enjoy the beauty of hot spots without tourists, to treat myself with a lot of sun and to make a lot of job done before the season. Life in Corfu, as a local one, brings its ups and downs. Last week I had no power, water and light in my house for like a day because of the strong and dangerous wind. However at the weekend we have visited beautiful village Kassiopi and enjoyed an amazing sunny weather. Today I'm coming to you from The Roda Beach which is located in the Northern side of the island. Roda is a traditional fishing village which has something for everyone, and will immediately help you to relax and wind down. Me and Pete are used to eat here the most delicious gyros in the area and to bring our pup to play at the clean and cute beach. It has a great family atmosphere and is famous for good and kind people. Till now I'm definitely agree with that. One of the most cool sweaters I've got in January - The Chunky Off Shoulder Sweater from Zaful. 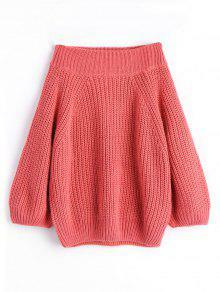 Since I have a thing for the bright clothes, I really like the peach pink color of the sweater. At the same time it feels very nice to the skin and is comfortable and cozy. It can be simply styled with any bottom from a mini skirt to a pair of skinny pants. White and pink sweaters are essentials in my wardrobe. They are life savers in the "bad weather" days and the gentle basis of the outfit in the good ones. It's a good investment into your wardrobe because this classic and wearable piece can be styled with everything. For a lot of years I'm used to have different models of them and still I'm always searching for more. I have so many jeans that anytime I find something different from my denim collection, I click "add to cart" button. This time I've risked and got Graphic Ripped Jeans from Zaful. I couldn't imagine that I will like this pair so much. It looks interesting and is a great add to my little collection. The pair feels free and comfortable, has good quality and cool color. 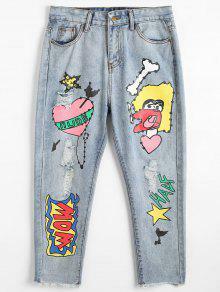 I know that not many of you would go with graphic jeans. It doesn't look serious and hard to style. However there are still a lot of models which can look great in an everyday life. If you find it too risky and aren't sure that it will be a great buy, you can try Sticker Patches. They are an easy way to add custom flair to jeans, jackets and more. Going so colorful with the outfit, I've decided to keep shoes and accessories classic and elegant. 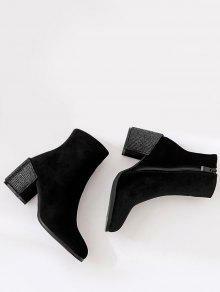 I've added Block Heel Ankle Boots from Rosegal and luxe Marc B. Bag. Both are in all black velvet and go perfect with each other. The pair of boots has stylish block heel with small rhinestones. Even you can't see it good at pictures, they shine so beautiful in real. Black velvet is really a great option for girls who live in Greece. It's the perfect add to any evening look and can be wearable all winter long whenever you are living: an island or mainland. It looks beautiful in the snow same as next to tropical palms. I adore classy and chic touch which it brings to the look. Thank you to Zaful and Rosegal for sponsoring this post.